109 chocolate recipes | chocolate recipes. Chocolate! One of the most versatile ingredients is found in many forms and many flavours. The seeds of the cacao tree undergo many processes to form cacao mass which is boiled to get chocolate liquor. The liquor is further processed into two components: cocoa solids and cocoa butter. Finally, with the addition of cocoa solids, cocoa butter or vegetable oils and sugar in different proportions, we obtain chocolate. There are major 4 types of chocolate: milk, unsweetened, dark and white. They can either be in the form of slab, callets, chips, powder, sauce, etc. Readymade chocolates are widely sold in the form of candy bars. They are even perked up with confectionery ingredients like nuts, caramel, wafers, etc. Forget store-bought candies and try your hands on them. The most basic recipe made with a chocolate slab is Tempered Chocolate. Tempering is a process to melt (Learn how to melt chocolate) and produce a crisp, satisfying snap of chocolate when you bite into it. It also provides a lustrous texture. You can chop the slab and either melt it in a microwave or on a double boiler. Tempered chocolate can be swirled on an ice cream or pastry, you can even dip strawberries into it or cook a rich hot chocolate and homemade chocolates. You can use tempered chocolate to make delectable treats like Almond Rocks and White Chocolate Walnut Praline Rocks. Wrap them in fancy paper and put them in a nice box and you are ready to give someone a handmade gift. Basic sponge cakes can be transformed into exotic treats like Death By Chocolate Pastry and Mango Chocolate Cake with an application of whipped cream and chocolate cream. Finish the cake with Chocolate Curls, chocolate vermicelli or chocolate truffle. One of my all-time favorites is the Black Forest Cake Recipe with intense chocolaty cake, sandwiched and coated with cream, dark chocolate flakes and juicy cherries. Coca-Cola can be blended with ice-cream to obtain a frothy Cola Chocolate Ice Cream Float. It is very quick and easy to make and will surely be a hit at parties. Also, you can try making the Banoffee Smoothie with a unique combination of bananas and coffee. Cupcakes are miniature cakes. A rich, velvety cupcake with buttery icing and various garnishes like Oreo crumble, edible silver balls, cherries etc. are loved by both adults and kids. Chocolate Chip Cupcake and Choco Almond Cupcake with decadent chocolate frosting are not only appealing but also, delicious. The combination of chocolate and strawberry with contrasting flavours will simply blow the mind and throw taste buds into a frenzy. Chocolaty Strawberry Yoghurt Fantasy and Strawberry Mousse Cake are two fabulous desserts that everyone will love. 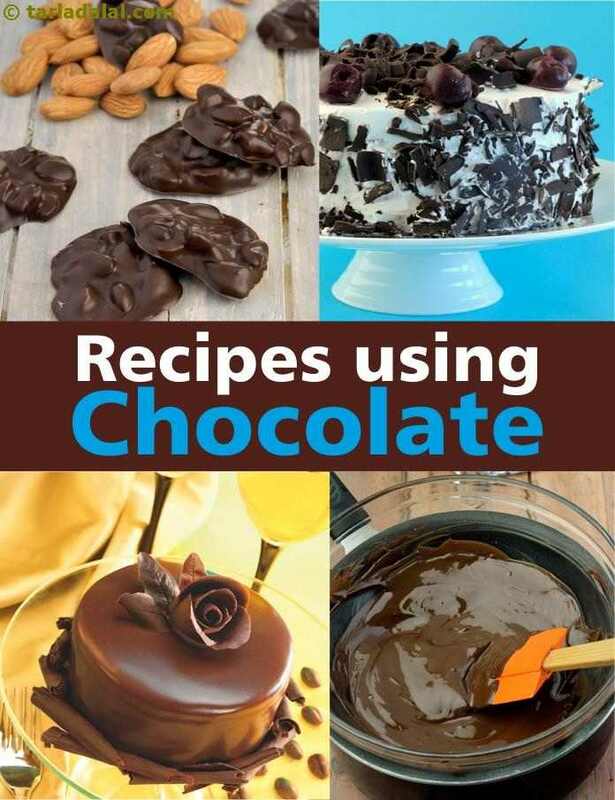 We are sure this sinful collection of chocolate recipes have made you drool. Do try your hands on them and enjoy with your friends and family. If this chocolate pastry does spell death, it is sure to be followed by heaven! An interesting way to serve your favourite ice-cream........in an edible cup! The aim is to melt the chocolate uniformly without cooking or burning it. Chocolate from a bar or block should be chopped or grated to ensure even melting. Here is how to melt the chocolate perfectly for a choco-licious end-result! A delicious, elegant no-fuss dessert that's a favourite with adults and kids alike. A rich fare of pears and chocolate sauce with vanilla ice - cream.